Pounce on this distinctive design for an unforgettable signature style. 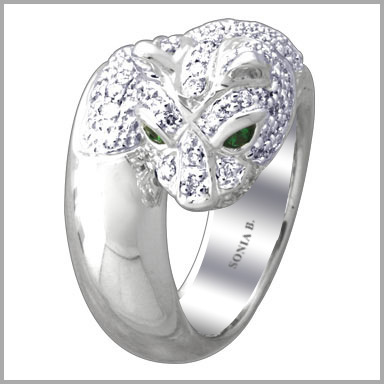 This daring panther ring is crafted in polished 14K white gold. It features two round cut 1.9mm tsavorite stones in channel settings. It is also encrusted with 112 full round cut diamonds in prong settings. The total tsavorite weight is 0.06ct and the total diamond weight is 1.00ct (both approximate). The diamond color is G-H with a clarity of SI. The setting size is 9/16" x 13/16" with a height of 3/8".